In March of this year, the International Football Association Board (IFAB), the body charged with updating and managing the rules of soccer worldwide, announced several revisions to the Laws of the Game. Coming on the heels of the introduction of video assisted review (VAR) to the pro game, the recent revisions mark a period of profound change in the way soccer is played, perhaps even rivaling the 1990s’ introduction of the back pass rule. The initial comments in the press regarding the rules changes have generally been positive. ESPN’s Michael Cox, for example, describes the new changes as “rewarding attractive play”. But the changes were designed largely with the professional game in mind, and the IFAB does not publish separate rules for the professional, amateur, and youth games. ​U.S. Soccer has yet to announce how and when the changes to the Laws will be implemented for the youth game in the United States, but regardless, the coming changes will have a substantial impact on the way our children play. So, for the sake of parents and their players out there, here’s a quick summary of the biggest of the upcoming changes, and what we can expect. Old Law: The deliberate act of the player making contact with the ball with a hand or arm is considered a foul. Commentary: No rule causes more consternation or confusion on the sidelines of America’s soccer field: when is a handball punished? We’ve all been to games where a sideline screams “Handball!”, only to have the referee waive it off. Under the old Law 12, the test of whether a handball is illegal depends on whether it was “deliberate”. If player touches the ball, but the referee rules it was not deliberate, then there is no foul. But what is “deliberate” often varies from referee to referee, and from person to person. The new rule is a compromise between those that think the old deliberateness standard is too vague and arbitrary, and purists that want to preserve the old way of doing things. The danger for the IFAB is that in pursuing this middle ground, they may wind up pleasing no one. Additionally, the revisions introduce a new ambiguity in that it’s unclear what is “unnaturally bigger” which will likely be a source of argument for some time to come. The revision then also further muddles things by adding some specific examples which should not be considered fouls, such as a player falling on his arm and the arm then touches the ball, or if a goalkeeper attempts a clearance but fails and then handles the ball. Perhaps the biggest challenge with regard to the introduction of the new handball rules will be with the training of youth referees. The time allotted to teach new referees is limited. I remember, for example, that in getting my introductory referee license for CalSouth, we spent an hour out of a day-long session just going over the offside rule, and the handball rules are now almost as involved as the offside rules. 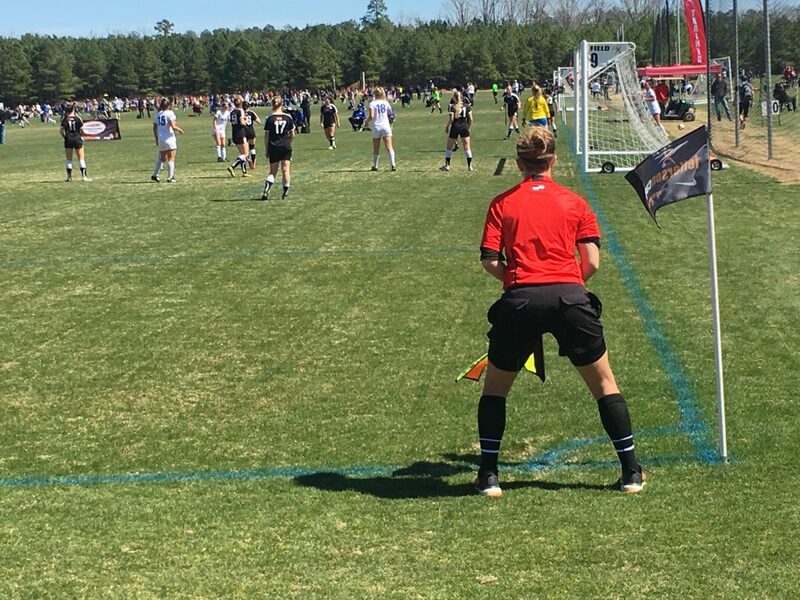 While the revisions may make it easier for more experienced referees to make consistent rulings, parents should expect that in the immediate future there might be a whole lot of variance in what referees call as they adjust to the new rules. Old Law: The old rules do not specify what the attacking team can do if the defending team sets up a wall. New Law: The revisions to Law 13 specify that when there is a wall of three or more defenders, the attackers are not allowed within 1 yard of the wall. Attackers less than 1 yard from the wall when the kick is taken will be penalized with an indirect free kick. Commentary: One of the instructions I’m almost always given by the CR when I’m serving as an AR for an olders’ game is to “watch the wall”. When there are teenagers involved, if the referee signals for a free kick, and the defensive team forms a wall, it’s almost inevitable that the attacking team will place some players within the wall as well and there will be some jostling between the players. According to the IFAB, “there is no legitimate tactical justification for attackers to be in the ‘wall’ and their presence is against the ‘spirit of the game’”. It will be interesting to see how coaches adapt to this change in the Laws of the Game. At a minimum, I suspect that coaches will be erring more on the side of (and goalkeepers instructed to build) a three person wall, as opposed to two. Referees will have to do some more space management since 1 yard isn’t a whole lot of distance and there are circumstances where ambiguity might exist over what exactly constitutes a “wall”. Old Law: In a dropped ball situation, the referee drops a ball in between two players who then try to win possession. New Law: Such a contested drop ball is effectively outlawed. If play is stopped inside the penalty area the ball is dropped to the goalkeeper (though, somewhat ironically, there is still no requirement for the goalkeeper to take a goal kick or free kick inside the penalty area), regardless of which team had possession. If play is stopped outside the penalty area, the ball will be dropped for one player of the team that last touched the ball at the point of the last touch. In all cases, all other players (of both teams) must be at least 4.5 yards away. Commentary: This is already effectively how many referees have been handling a dropped ball situation that results, for example, from an injury of a player when no foul occurs. However, this might pose more of a challenge for referees dealing with kids under 10, who lacking the coordination of older children, often take stumbles or balls to the face. A referee might be less likely to stop play in the penalty area when a child goes down, because such a move will turn over the ball to the other team. Parents might have to get used to waiting a beat in such circumstances for a child to be attended. Referees (who in many situations now days may lack the luxury of ARs) also have a lot to keep their eyes on: fouls, misconduct, injuries, offside, the goal line, the touch line, and whether a goal is scored. A referee may be tempted, if they are unsure who at the time has possession, to delay whistling in order to avoid forcing an unintended turnover of the ball even if outside of the penalty area. Old Law: A referee is considered an obstacle, like a goalpost, and if the ball strikes the referee, the teams play on. New Law: If the ball touches a referee and goes into a goal, starts a promising attack, or changes possession, a dropped ball is awarded. Commentary: This is going to be a hard one for youth referees, particularly those operating without a full crew of ARs to help. I know when a ball comes screaming at me, the first thing I’m usually thinking to myself is “Get out of the way!”. The first thing on my mind isn’t noticing which team has possession so a dropped ball can be properly awarded, and noticing if possession has in fact been changed by my body being in the way. I hope referees won’t respond by avoiding being in midst of the action (where they can police for fouls and misconduct), but I’m afraid this change to the Laws might incentive some youth referees to hang closer to the center circle. Old Law: The ball has to leave the penalty area on a goal kick in order to be in play, otherwise the kick is retaken. New Law: New Law 16 specifies the ball is in play once the kick is taken and can be played before leaving the penalty area. Commentary: I’ve already written extensively about this revision in my prior article [located here]. I think for clever coaches, this revision brings more opportunity for clever play, but for coaches that might be a little more fearful or adverse to a possession game, this will be further incentive to have a strong legged defender just boot the ball down the field. Old Law: Winner of the coin toss could choose the direction in which they attack. New Law: New Law 8 specifies the team that wins the toss can now choose to take the kick-off or which goal to attack. Commentary: The IFAB explains that recent changes to the Laws of the Game “have made the kick-off more dynamic (e.g., a goal can be scored directly from the kick-off) so captains winning the toss often ask to take the kick-off”. I’ve had several kids tell me that if they “win” the coin toss it doesn’t really feel like winning if they don’t have the choice of what will happen. The revision doesn’t really change anything, and the kids will probably like having the choice. Coaches wanting to secure a particular goal at the start when field conditions are uneven (such as when the sun is in the way of a goalkeeper’s vision or there is a slope to the field), will have to take care the kids are instructed before heading out to the field for the coin toss. Old Law: The goalkeeper had to remain on the goal line until the kick is taken. New Law: The revised Law 16 specifies a goalkeeper needs to only have one foot on the goal line (or in line with the goal line if jumping) when the kick is taken. Commentary: The change is a good one for goalkeepers. The IFAB states that because a kicker can stutter a run, it’s only reasonable that a goalkeeper can take one step in anticipation of the kick. The first movement a goalkeeper makes to execute a proper extended dive is to power step forward, in order to be able to get enough force to leap towards the ball. As a result, many goalkeepers, on both the pro and youth level, were taking these power steps before the ball was struck. The change will allow properly trained goalkeepers to more effectively defend against penalty kicks without fear of having the penalty kick retaken. Old Law: Players could leave at the halfway line. New Law: A player who is being substituted must leave the field by the nearest point on the touchline/goal line (unless the referee indicates the player can leave quickly at the halfway line or a different point because of safety or jury). Commentary: This is a rule that will no doubt need to be adjusted by US Soccer and local regions for the youth game. First, in situations where there are unlimited substitutions (particularly if a referee is operating without ARs), the modification makes the referee’s job of keeping track of the number of players on the field harder. More importantly, there are safety concerns with having young players leave the field at points along the touchline opposite their own bench, particularly if the opposing team’s bench or parent supporters are seated there. Old Law: No cards for coaches and other team officials, though numerous leagues and regions in the US implemented cards and/or ejection procedures for coaches, managers and parents. New Law: A team official guilty of misconduct will be shown a yellow card (caution) or red card (sending-off) and if the offender cannot be identified, the senior coach in the technical area will receive the card. Commentary: From a referee’s perspective, any tool that helps managed the side lines will be a welcomed change. No doubt local regions and leagues will have input about exactly how referees manage these situations, and the resulting associated penalties for having a card shown. Some of the new Laws of the Game will be a challenge for youth soccer. Considering in particular the large segment of the Laws which relate specifically to the pro game (such as VAR), the IFAB should consider publishing separate rules for the pro and youth game. Unfortunately, US Soccer has little influence when it comes to these revisions, and participants (whether coaches, referees, parents or players) will just have to adjust through the growing pains, especially if further tweaks come down in response to any unintended consequences which might be discovered along the way. In particular, it may take our overworked and sometimes under appreciated referees some time to get fully up to speed, depending on when and how US Soccer rolls out the changes. For the sake of the kids, however, we should all be prepared to show our patience.